In the far future, the Doctor, Rose and Captain Jack find a world on which fiction has been outlawed. A world where it’s a crime to tell stories, a crime to lie, a crime to hope, and a crime to dream. But now somebody is challenging the status quo. A pirate TV station urges people to fight back. And the Doctor wants to help until he sees how easily dreams can turn into nightmares. 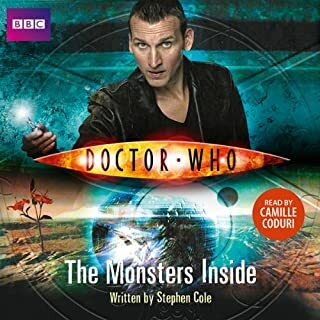 With one of his companions stalked by shadows and the other committed to an asylum, the Doctor is forced to admit that fiction can be dangerous after all. Though perhaps it is not as deadly as the truth. Somebody’s interfering with time. The Doctor, Rose and Captain Jack arrive on modern-day Earth to find the culprit - and discover a Neanderthal Man, twenty-eight thousand years after his race became extinct. Only a trip back to the primeval dawn of humanity can solve the mystery. Who are the mysterious humans from the distant future now living in the distant past? What hideous monsters are trying to escape from behind the Grey Door? Is Rose going to end up married to a caveman? Rose and the Doctor return to present-day Earth, and become intrigued by the latest craze the video game, Death to Mantodeans. Is it as harmless as it seems? And why are so many local people going on holiday and never returning? Meanwhile, on another world, an alien war is raging. The Quevvils need to find a new means of attacking the ruthless Mantodeans. Searching the galaxy for cunning, warlike but gullible allies, they find the ideal soldiers on Earth. The ‘Tardis’ takes the Doctor and Rose to a destination in deep space - Justicia, a prison camp stretched over seven planets, where Earth colonies deal with their criminals. While Rose finds herself locked up in a teenage borstal, the Doctor is trapped in a scientific labour camp. Each is determined to find the other, and soon both Rose and the Doctor are risking life and limb to escape in their distinctive styles. But their dangerous plans are complicated by some old enemies. When a naval cruiser sinks in mysterious circumstances in the North Sea, all aboard are lost. Rose is saddened to learn that the brother of her friend, Keisha, was among the dead. And yet he appears to them as a ghostly apparition, begging to be saved from the coming feast... the feast of the drowned. As the dead crew haunt loved ones all over London, the Doctor and Rose are drawn into a chilling mystery. In 1920s London, the Doctor and Rose find themselves caught up in the hunt for a mysterious murderer. But not everyone or everything is what they seem. Secrets lie behind locked doors and inhuman killers roam the streets. Who is the Painted Lady and why is she so interested in the Doctor? How can a cat return from the dead? Can anyone be trusted to tell or even to know the truth? ‘The Dead are not alone. There is something in the mist and it talks to them.' In a remote clinic in 18th-century Italy, a lonely girl writes to her mother. She tells of pale English aristocrats and mysterious Russian nobles. She tells of intrigues and secrets, and strange faceless figures that rise from the sea. And she tells about the enigmatic Mrs Pond, who arrives with her husband and her physician. What she doesn’t tell her mother is the truth that everyone knows and no one says that the only people who come here do so to die. The TARDIS lands in 22nd-century Africa in the shadow of a dormant volcano. Agricultural teams are growing new foodstuffs in the baking soil to help feed the world's starving millions ¿ but the Doctor and Rose detect an alien signal somewhere close by. When a nightmare force starts surging along the dark volcanic tunnels, the Doctor realises an ancient trap has been sprung. But who was it meant for? And what is the secret of the eerie statues that stand at the heart of the volcano? Starfall: a world on the edge, where crooks and smugglers hide in the gloomy shadows and modern technology refuses to work. And that includes the TARDIS. The pioneers who used to be drawn by the hope of making a fortune from the mines can find easier picking elsewhere. But they still come... for the romance of it, or old-fashioned organic mining. Or in the hope of finding the lost treasure of Hamlek Glint, scourge of the spaceways, privateer, adventurer, bandit. Ever Wonder How It Went After the Doctor Helped? Mickey is startled to find a statue of Rose in a museum; a statue that is 2,000 years old. The Doctor realises that this means the TARDIS will shortly take them to Ancient Rome, but when it does, he and Rose soon have more on their minds than sculpture. In the city-state of Geath, the King lives in a golden hall, and the people want for nothing. Everyone is happy and everyone is rich. Or so it seems. When the Doctor, Amy and Rory look beneath the surface, they discover a city of secrets. In dark corners, strange creatures are stirring. At the heart of the hall, a great metal dragon oozes gold.Then the Herald appears, demanding the return of her treasure... And next come the gunships. On a lonely stretch of Welsh coastline, a fisherman is killed by a hideous creature from beneath the waves. When the Doctor and Rose arrive, they discover a village where the children are plagued by nightmares, and the nights are ruled by monsters. The villagers suspect that ancient industrialist Nathanial Morton is to blame, but the Doctor has suspicions of his own. Who are the ancient figures that sleep in the old priory? What are the monsters that prowl the woods after sunset? Narrated and Written by THE (4th) Doctor!! The TARDIS arrives in Gaul in AD 451, on the eve of battle between the forces of Attila the Hun and those of the crumbling Roman Empire. But the Doctor soon finds that both sides are being helped by sinister supernatural creatures. While Graham makes allies in the Roman camp and Ryan is pursued by the enigmatic Legion of Smoke, the Doctor and Yasmin are pressed into service as Attila’s personal sorcerers. But the Doctor knows there is science behind the combat magicks - and that the true war will pit all humanity against a ruthless alien threat. Let me tell you a story. Long ago, in the frozen Arctic wastes, an alien army landed. Only now, 10,000 years later, it isn't a story. And the army is ready to attack'. New York is one of the greatest cities on 21st century Earth...But what's going on in the Museum? And is that really a Woolly Mammoth rampaging down Broadway? An ordinary day becomes a time of terror, as the Doctor and Amy meet a new and deadly enemy. Stuart Milligan reads this thrilling adventure featuring the Ninth Doctor, Rose and Captain Jack. 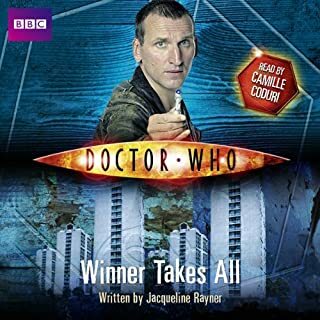 .Featuring the Doctor as played by Christopher Eccleston, together with Rose and Captain Jack as played by Billie Piper and John Barrowman in the hit series from BBC Television. Anyone with a tin ear who can't tell a decent accent from a lousy one. Would you recommend Doctor Who: The Deviant Strain to your friends? Why or why not? No. Anyone who's never listened to Doctor Who books before would be put off for good, and anyone who has listened before would be appalled. The voices of Doctor Who characters are very, very well known to their fans. Not all narrators attempt to capture each character's voice, and fair enough. Stuart Milligan *attempts* it, but does not succeed. His accents are all over the board -- the Russians sound more like Mexicans, Rose sometimes has the same accent as the Doctor, and the Doctor, well, he sounded more like a caricature of an Englishman. Milligan's intonational patterns were likewise bizarre, as if he were reading the book for the first time aloud and didn't realize how the sentence was going to end. I don't want to be harsh, but as an aficionado of audio books and Doctor Who books in particular, it just wasn't good enough, and I will not listen to Milligan again. I have, however, listened to several other Justin Richards books and enjoyed them very much. This time, I really didn't, but I believe that's down to the performance more than the writing, although it's difficult to separate one from the other. What character would you cut from Doctor Who: The Deviant Strain? Would you try another book from Justin Richards and/or Stuart Milligan? I would buy another Justin Richards book, but I would NEVER listen to Stuart Milligan ever again if he was the last audio reader on earth. If someone, anyone else read it. Note to BBC Audio: NO MORE AMERICAN READERS! This story depicts Jack, the Doctor and Rose answering a distress beacon. The signal takes them to Russia and of course there is a mystery to solve. The story is fine and entertaining enough. Unfortunately the narrator is so off target and his accents so terrible that I nearly quit as soon as I started. The Doctor sounds more like Doolittle than Who. Rose's accent waivers all over the British Isles and Jack's is passable. The Russians in the story often sound more Mexican than Russian. I don't know if he was unfamiliar with the characters, was not given enough time to prep, or this is just not a good venue for Stuart Milligan. 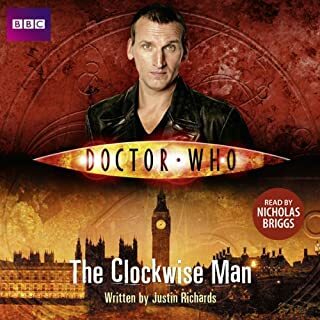 I have to say that without a doubt this is the worst voice work I have ever encountered in a Dr. Who audio book which is really to bad because Milligan has a very nice voice when not trying to do the characters. I tend to listen to Doctor Who books repeatedly while driving. I like a familiar story in the car. This one I got through twice, barely. I'd like to change the narrator. It did seem like he was trying, but he simply wasn't getting the accents right. It would have been better to not do them at all. I still could have listened to the story. What was most disappointing about Justin Richards’s story? I can't say about the story, I only heard 20min of it. Who would you have cast as narrator instead of Stuart Milligan? No. Would found out if he can accurately copy the diverse accents BEFORE completing the project. The Ninth Doctor is my favorite and I've relished the novels in which he is featured, but The Deviant Strain was the absolute worst way for me to wrap up Nine's stories. It broke my heart to rate this as low as I did. Poor Stuart Milligan has been torn apart in the reviews, and unfortunately, I can't defend him. It was a gamble to have an American narrate something so quintessentially British, and that gamble was lost. Captain Jack is the only person in this book who is supposed to have an American accent, but Mr. Milligan failed to capture even Jack's voice. I'm no connoisseur of British accents, but even I can tell that the accent Mr. Milligan used for the Doctor in no way resembles the Northern accent of Christopher Eccleston. None of the characters sound like themselves and it really pulled me out of the story. Speaking of the story, I didn't care for it, either. The setting is interesting, but the plot and motivations have left me cold (no pun intended). Full disclosure: I have not finished this story, and with 90 minutes left to go, I probably never will. I would recommend this book only to people who feel compelled to have complete collections. It is not enjoyable in the least. A great tale of the Doctor in a remote location with strange goings on. Of course, that describes just about every Doctor Who story, but this one raises the bar and is quite well performed. I'm sorry, but Doctor who is ENGLISH. Having someone doing the most APPALLINGLY bad English accent for both Rose and The Doctor DOES NOT WORK!!!!! I have only listened for 10 minutes and I really don't know if I can be bothered listening to the rest. The reading of the books are horrible and does nothing to cover up the shallow plot lines. Should stick with what works - TV shows. Books is not Dr. Who's strong point. 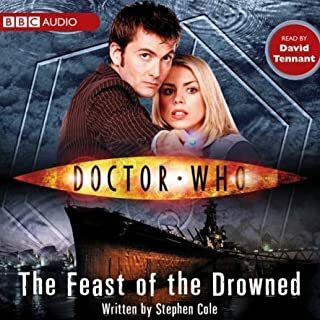 This was a good story, ruined by the narrator, who obviously had no idea that this incarnation of the Doctor was a Northerner, and had him talking with the proverbial plum in his mouth, also made no attempt to make Rose sound like a Londoner. His Russian accents also tend to grate a bit. Wouldn't the Tardis translation matrix mean they wouldn't have noticable accents anyway? The story itself is good, and progresses well, with some neat plot turns, and was a story I wanted to keep listening to. Justin Richards has the characters well defined, and this would have made a good TV 2-parter. I would have given 5 stars if the narration hadn't been so irritating. I did finish up wondering how many 'decommissioned' nuclear subs are in the condition of the ones in the story. Nice to get a brief mention of Bad Wolf, too. Doesn't seem like this narrator has ever watched Doctor Who. The voices are so far off the mark it's really ruining the story for me. loved it and was gripped till the final chapter, plot was full of twists and turns! just like a real Dr who episode! Would you try another book written by Justin Richards or narrated by Stuart Milligan? This was a good story with twists and turns and pace that kept me involved. But the narrator Stuart Milligan had clearly never seen any of the episodes with Rose and the Doctor. The Doctor (Christopher Ecclestone) has a northern English accent, and Rose has a South East London accent. Neither of them had the strange "posh" Englsih accent used. The writer had written in the correct style, which made the misuse of the accents even more irritating. What was one of the most memorable moments of Doctor Who: The Deviant Strain? The final battle builds well to a great climax. Well worth waiting for. Would you be willing to try another one of Stuart Milligan’s performances? Not if there were any english characters in the story. Was Doctor Who: The Deviant Strain worth the listening time? Yes - despite the reservations about the narration. It was a good story.